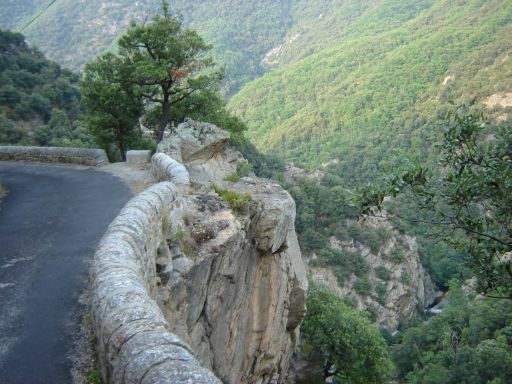 The road into the mountains to Mas de la Fargassa, is breathtakingly beautiful but narrow and windy (about 30 minutes). It is not suitable for big campers or caravans, only for small campers. There are just a few places to turn back! You can find the way to Mas the la Fargassa on most navigation systems by entering our name. The whole of the route can be found and visualised on Google Earth. Our GPS coordinates are: 42.436081 – 2.673027. A9 Perpignan direction Barcelona – Last exit before the Spanish border- “Le Boulou” leave the A9 and follow D115 direction Ceret and Amélie les Bains. Drive through Amélie les Bains until sign “end of Amélie les Bains”, opposite a large car park. Turn a sharp left, take the D53 direction Montalba and Mas Pagris. After 300 meters go to the right (Rte Montalba l’Eglise). Follow this road for about 4 km until the road forks, keep to the right, direction Mas Pagris. After 1 km the road becomes more narrow and particularly lovely!! After the few houses of Mas Pagris you cross the bridge over the river Therme. After the bridge another 2 km until the first letterbox with sign “La Fargassa”. Take the train to Perpignan. Form Perpignan take the E1,- bus in the direction of Arles sur Tech. Your stop is at: “ Gare Routière” in Amélie les Bains “. You can take a beautiful 2 hour trip up the mountains or just give us a call, we would be happy to pick you up. Perpignan has it’s own airport. During the whole year cheap flights can be booked to Perpignan. Especially Ryan Air offers many affordable off-season flights to Gerona Airport. From Perpignan or Gerona airport it’s easy to rent a car for your holiday.